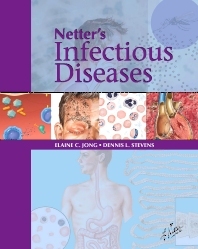 Netter’s Infectious Diseases provides a comprehensive yet concise overview of current global infectious disease concerns. Elaine Jong and Dennis Stevens, and panel of expert contributors cover the basics of the field using beautiful Netter illustrations and accessible "need to know" information on major conditions and problems—including vaccine-preventable diseases, drug-resistant Staph and TB infections, pandemic flu, echinococcosis, and Chagas' disease. It’s a great tool for quick review or for sharing with patients and staff. Access "need to know" information from the uniformly concise text and instructive Netter paintings. Stay current on modern infectious disease concerns—such as vaccine-preventable diseases, drug-resistant Staph and TB infections, pandemic flu, infections in compromised hosts, reproductive tract infections, infections transmitted from animals to man, and imported infections such as malaria, echinococcosis, and Chagas' disease—with new illustrations in the Netter tradition specifically created to address new topics.